Bernice Pauahi Bishop Museum presents a new exhibit that delves into the wonders of Rapa Nui, or Easter Island. Showcasing Bishop Museum’s extensive cultural and natural science collections from the island, “Rapa Nui: The Untold Stories of Easter Island” draws from recent studies conducted by Bishop Museum researchers and collaborators to highlight some lesser-known stories about the island. More than 150 cultural treasures and never-before-seen biological specimens from the museum’s collections will be on display together for the first time in the museum’s history. The exhibit is on display in the Castle Memorial Building from Nov. 3, 2018–May 5, 2019, and will be joined by a complementary exhibit “Ka U‘i: Contemporary Art from Rapa Nui,” curated by Macarena Oñate and featuring works by eight Rapa Nui-based artists who explore Rapanui identity, politics, the environment, and ancient art forms through contemporary media including sculpture, photography and painting. As part of this multifaceted endeavor, a concurrent exhibit, “Hare Tao‘a, Hare Taŋata” will open at the Museo Antropológico Padre Sebastián Englert (MAPSE), the local museum on Rapa Nui, from Nov. 13, 2018–Feb. 2019. This collaborative exhibit has been developed by Bishop Museum together with colleagues at MAPSE, and will feature a highly significant stone carved with intricate petroglyphs from the Bishop Museum’s collections, images from Bishop Museum’s Archives, and objects from the collections of the Rapa Nui museum. 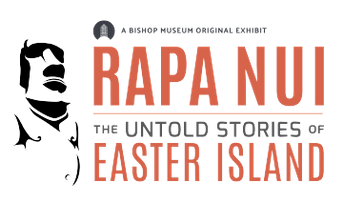 The creation of the exhibitions “Rapa Nui: The Untold Stories of Easter Island” and “Hare Tao‘a, Hare Taŋata” is a prime example of how Pacific island communities and relationships can be strengthened through museum initiatives.